Bodnarus Auctions is hosting a two-day auction from the McDowall, Saskatchewan with online bidding making it available to the world. 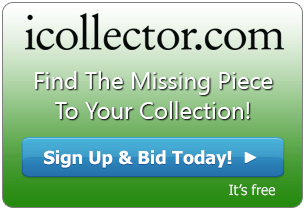 There are over 700 lots spread between the two days with something for every collector. Included are advertising signs, vintage toys, tins and crocks, figurines and glassware as well as lamps and lanterns. Also presented are collectible license plates and musical, a selection of vintage furniture, and much more. Both days will be fast paced with everything selling to the highest bidder. Some selections to take a look at in the first day involve the always popular coke advertising collectibles. Lot 177 is a Coke advertising poster that measures 24” by 36” with a cardboard back. There is a grouping of Coke and Pepsi bottles available for collectors and Lot 427. And, a great collection of Coke bottle caps and Coke hockey photos from 1964-65 are up for grabs at Lot 471. There are some great stoneware pieces also highlighted on Saturday’s session. Lot 91 is a small stoneware jug from The Goodyear Tire and Rubber Company. A set of 2 jugs will sell to the highest bidder at Lot 103, and 2 Dundee Marmalade jars can be fetched with best bid on Lot 142. 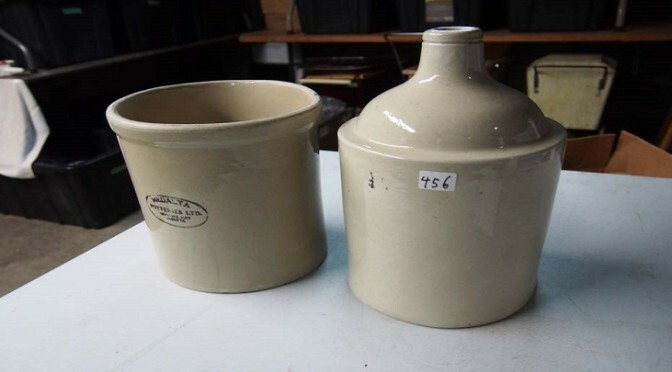 Near the end of the day, there is a fantastic ½ gallon Medalta Crock and Stoneware jug presented at lot 456. All items in this session will sell to the highest bidder all opening at $10. There are photos and descriptions all available on iCollector.com. There are many lamps in this catalog. In the 2nd session on March 6th, there are several interesting ones to chose from. There is a vintage oil lamp at Lot 510 and three coal lamps available for bidding at Lot 583. A pair of beautiful milk glass oil lamps are showing later in the day at Lot 986, and there is even a pair of electric lamps up for sale at Lot 513. This session also includes over 25 lots of vintage bottles to pick up. Lot 515 presents the always popular Coke brand with some Aqua Coke bottles and a mini Coke glass. Stubby pop bottles and a six pack are presented for collectors at Lot 585 and Dreweys Pop has a 6 pack of bottles in the next Lot at 586. A selection of old embossed pop bottles is put together into onr price for Lot 597. All of the bottles are ready to collect and have photos for inspection in the online catalog. Both auction dates, March 5th and 6th, 2016, open for live bidding at 10AM Central Time from Bodnarus Auctions and online bidding through iCollector.com. Absentee bids are currently available and bidders from around the world are invited to join in the action. The auctioneer will be pleased to answer any questions about each lot up for auction and has a great reputation for after auction service.